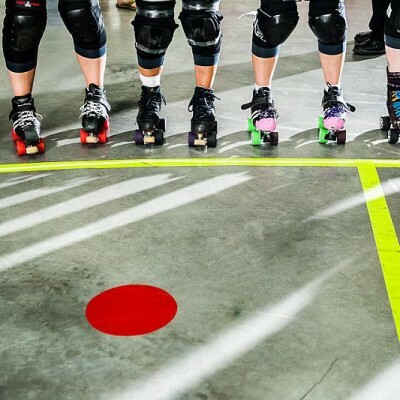 This week I’m offering a sneak peek into what Membership looks like at Roller Derby Athletics. Whether you’re an All-Star Member, or a full-blown MVP (which gets you full access to all the training programs too), every single week I create and send out a workout like this one (originally posted in November, 2014). There isn’t always a real-time video to follow along with, but with each workout, I link back each of the movements to a detailed instructional How-To video that gives you the correct form, and mistakes to avoid. I’ve included one below for you to check out what they’re like. 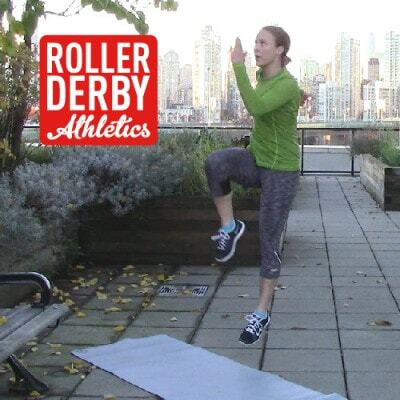 Each workout always includes a warmup suggestion, a stability training exercise, and a cool down. 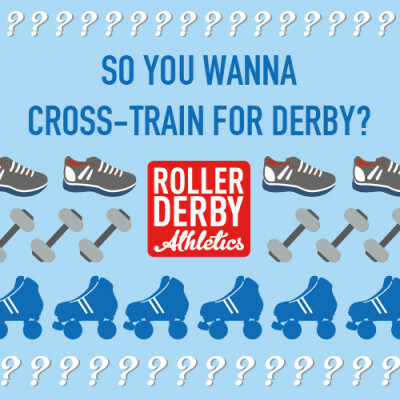 For more info on Memberships at RDA and what’s included (hint: a ton of stuff! ), learn more at Becoming a Member. Bonus: In this one you get to watch me absolutely dog it through this workout – it’s a toughie!! I’m huffin’ and puffin’ out there! This Side 2 Side Workout is an AMRAP… that stands for As Many Reps/Rounds As Possible. You set your timer for 15 minutes, and you see how many rounds of this workout you can get through – of course, good form is much more important than achieving more rounds! This one is also focussed on single-leg activities. 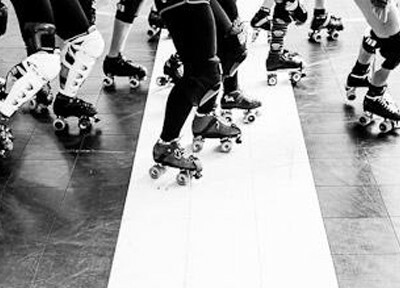 Because, you know, we don’t usually stride with both feet at once. At least… I don’t. If you do, please send me a picture. Doing these plyometric and single-sided strength moves will really help build your explosive power. It puts a lot more load on the motion to do it with a single leg instead of both. It’s a great way to power up a workout when you’re ready for a challenge! If this workout seems out of reach for you today, you can try it instead with both legs for some of the moves – check the modifications below. You need: A timer! Mat optional – nice to have for the squat thrusts and push-ups. Repeat all through as many times as you can! Stability Training: Finish with 30 Slow Bicycle Situps (see video below!) = 15 per side. Watch the video for all the moves! Suggestions for making this easier: Do the squat thrusts and push-ups with both feet; or do push-ups from the knees. After this workout, you deserve a high five. Post your results in the comments so that we can all High Five you! PS: here’s that How-To video I was talking about sharing with you – Bicycles! This is the stability exercise for the week. Now tell me how you did, by leaving a Reply below! Did this today, 4.5 rounds, modified the thrusters and push-ups to both feet. This was brutal! And I still have the rest of my workout to do… Anything to get that Boot. Wow, Nice work, Pikacheek! With determination like that, the Battle for the Boot shall surely end with your victory!